The focus of the 2015 movie Woman in Gold is the Viennese artist Gustav Klimt's famous 1907 painting of Adele Bloch-Bauer, one of his patrons, and, along with her husband, who commissioned the portrai, the leading light of one of Vienna's most famous pre-World War I's salons. After Hitler's take-over of Austria in 1938, the portrait was one of many stolen from the Bloch-Bauer's collection under the Nazi 'Aryanisation' scheme of "confiscating" Jewish art works, property, and businesses. Several decades later the Bloch-Bauer's niece, Maria Altmann, began a legal battle to recovery the family's art works from the Aistrian government. General George Armstrong Custer (center), one of the American West's most controversial figures, has been the subject of several movies. 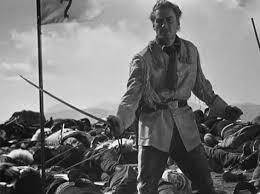 Errol Flynn, above right, in They Died With Their Boots On, portrayed him as a dashing, courageous leader of men and protector of the Indian. But in the,the revisionist Little Big Man, Richard Mulligan's Custer (above left) is a preening, ambitious, arrogant and eventually crazy murderer of women and children. This 1970 Vietnam Western uses the figure of Custer to explore issues of genocide and racism. Turing as portrayed in "The Imitation Game"
The enigmatic and controversial Alan Turing, brilliant mathematician and one of the leading code-breakers at Bletchley Park is the subject of the 2014 movie The Imitation Game, where he is portrayed by Brendan Cumberbatch. 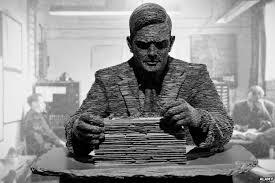 The movie, like most accounts of Turing's work at Bletchley Park, gives a misleading impression of Turing's contribution to two of the essential breakthroughs at deciphering the German World War 2 military codes: Enigma and Tunny, and in devising the two machines - the Bombes and Colossus - that effected the decoding. 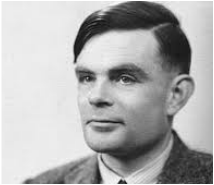 It also falsely claims that Turing's homosexuality enabled him to be blackmailed by a Soviet spy at Bletchley. 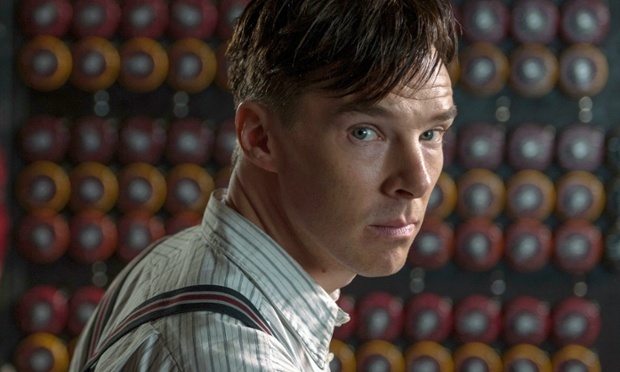 Cumberpatch's intense performance, although most impressive, also gives a misleading impression of Turing's personality. In public he was much more confident and forceful; he travelled widely,was not particularly insensitive or arrogant, was not a loner, and was quite open about his homosexuality. Heydrich - Hitler called him "the man with the iron heart". He was Himmler's go-to man: "Himmler's brain is called Heydrich". Jan Kubis and Josef Gabcik, the two members of the Czechoslovakian assassination squad who attacked Heydrich with grenade and pistols. Surprisingly, the dramatic assassination of Reinhold Heydrich and the German hunt for those responsible has been the subject of only a couple of movies. The attack that eventually killed Heydrich in Prague ( Operation Anthropod) and the siege that quickly followed as the Nazi cornered the assassination squad in a cathedral were highly dramatic. However, the ultimate consequences of the German revenge were so horrific that even after six decades the subject remains by-passed by film-makers.